A pair of shell-like forms contain the two halls of this performing arts centre in Kansas City by Israeli architect Moshe Safdie of Safdie Architects. Clad in stainless steel panels, the 1,800-seat Muriel Kauffman Theatre and the 1,600 seat Helzberg Hall comprise the Kauffman Center. The two venues are connected by a 20 metre-high glass-walled atrium that is anchored to the ground by a line of steel cables. Dressing rooms and rehearsal areas are shared between the theatre and hall. Photography is by Tim Hursley. Kansas City, MO, May 5, 2011 – The Kauffman Center for the Performing Arts, a major new center for music, opera, theater, and dance, will open in downtown Kansas City, Missouri on September 16, 2011. The Kauffman Center will present a wide range of entertainers and performances from around the world, including classical, pop, and jazz music, ballet and contemporary dance, Broadway productions, comedy shows, and more. In addition, the Kauffman Center will serve as the performance home of three of the region’s leading performing arts organizations—Kansas City Ballet, Kansas City Symphony, and Lyric Opera of Kansas City. The Kauffman Center will further advance the role of the arts as a catalyst for the educational, civic, and economic vitality of Kansas City. When it opens, the Center will be one of the most technically and architecturally advanced performing arts centers in the nation, allowing its resident companies and presenters to stage more sophisticated work, encourage interdisciplinary collaboration, and foster the cross-fertilization of audiences. Designed by Moshe Safdie, the 285,000-square-foot facility will include two stand-alone halls—the 1,800-seat Muriel Kauffman Theatre and the 1,600-seat Helzberg Hall—both housed within a dramatic overarching shell featuring a glass roof and glass walls that provide sweeping views of Kansas City. The $413 million project includes $326 million for the creation of the performing arts center, a $40 million endowment, and a $47 million, 1,000-car underground parking garage funded by the City of Kansas City, Missouri. The Kauffman Center has raised more than $377 million to-date, over 91 percent of the total funding. Major gifts have included $30 million from the Ewing Marion Kauffman Foundation, $23 million from the Hall Family Foundation, $12 million from the Joe and Jeanne Brandmeyer Family Foundation, and $10 million from Shirley B. and Barnett C. Helzberg. 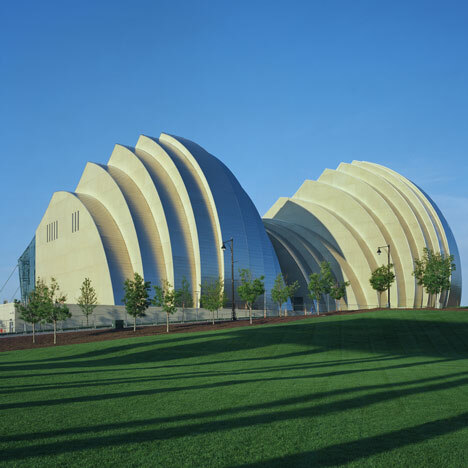 In December 2000, the Kauffman Center received a $105 million gift to launch the project from Julia Irene Kauffman and the Muriel McBrien Kauffman Foundation—a fund established by the late civic leader and philanthropist to support organizations and programs that enhance the quality and accessibility of the arts in the greater Kansas City community. In 1994, Muriel Kauffman began planning for the creation of a performing arts center in Kansas City. Since her death, Muriel’s daughter, Julia, Chairman of the Board of the Kauffman Center and Chairman/CEO of the Muriel McBrien Kauffman Foundation, has worked to realize her mother’s vision. “The Kauffman Center will be an incredible resource for performers and audiences and a destination for everyone in the Greater Kansas City area. My mother’s dream was to foster extraordinary and diverse performing arts experiences in Kansas City, and I am proud that the Center will make this vision a reality for current and future generations,” said Julia Irene Kauffman. Situated on 5 acres, including the 113,000-square-foot Performing Arts Center Terrace which will be used for outdoor performances and as a public gathering space, the Kauffman Center bridges three of Kansas City’s most dynamic downtown neighborhoods—the high-rise urban core of downtown to the north and east; the Crossroads Arts District, a low-rise neighborhood of industrial warehouses that has become a mecca of artist residencies, galleries, small business and shops to the south; and the Power & Light District, an entertainment center and home to the recently opened Sprint Center, to the northeast. The Kauffman Center will serve as a second cultural cornerstone in the city’s already vibrant arts community along with the recently expanded Nelson-Atkins Museum of Art and its neighbors, the Kemper Museum of Contemporary Art and Kansas City Art Institute. The Kauffman Center’s two performance venues, Muriel Kauffman Theatre and Helzberg Hall, are two distinct structures, each existing in their own acoustical envelope and housed within a dramatic architectural shell. This shell features a glass roof and glass walls, creating the Center’s shared public spaces, a series of interior piazzas. Safdie collaborated with Richard Pilbrow of Theatre Projects Consultants and Yasuhisa Toyota of Nagata Acoustics America on the design of both halls, which will share backstage facilities, including dressing accommodations for over 250 performers, as well as 11 rehearsal and warm-up rooms. The Center has been designed so it can accommodate future expansion along the east side of the building. The north elevation of the building, which faces downtown Kansas City, features a series of arched walls sheathed in stainless steel that rise from the ground like a wave. From its crest a curved glass roof sweeps down towards the low-rise Crossroads neighborhood to the south and cascades into a 65-foot high by 330-foot wide glass wall, which provides the Kauffman Center’s Brandmeyer Great Hall with panoramic views of Kansas City. This dramatic glass façade and roof are anchored by 27 high-tension steel cables, reminiscent of a stringed instrument. The Muriel Kauffman Theatre will host dance performances, plays, musicals and more, and will serve as the performance home of Kansas City Ballet and Lyric Opera of Kansas City. The 1,800-seat venue is designed to be visually striking, yet retain an intimate experience for both audiences and performers. Inspired by the great opera houses of Europe, audiences are seated in front of the stage in a variation on the traditional horseshoe configuration—bringing them closer to the performers than in traditional auditorium-style venues. The design of the Muriel Kauffman Theatre’s expanded facilities will provide dramatically enhanced performance capabilities—including a vast 5,000-square-foot stage; a flexible orchestra pit that can accommodate 95 musicians; increased backstage facilities; a 74-foot tall fly tower; and a flexible proscenium stage opening. The Theatre’s fly tower will allow for scenery as tall as 30 feet to be flown above the stage, allowing productions to make use of more sophisticated scenic design elements. The stage’s flexible proscenium opening will allow the width and height of the stage to be adjusted, making it tremendously adaptable and allowing for both intimate and larger-scale productions. The Theatre will also offer the Figaro seatback system, with a personal monitor mounted on each seat for productions requiring translation. From chamber music to full orchestra, from jazz and pop to lectures and recitals, Helzberg Hall will be the performance home of the Kansas City Symphony as well as host to renowned international soloists and ensembles. Named in recognition of a $10-million gift from Shirley B. and Barnett C. Helzberg, the 1,600-seat venue is oval in shape, with a vineyard-style seating configuration. The stage extends approximately one-third of the distance into the Hall, thus placing 40 percent of the seats alongside or behind the orchestra. This creates an intimate and immersive experience for both artists and audiences and allows a portion of the audience to experience the musician’s perspective during performance. The distance from the stage to Helzberg Hall’s farthest seat is just over 100 feet. The Hall will feature mechanical risers that allow the layout of the stage to be altered quickly and easily, greatly expanded backstage facilities, and acoustics which can be readily customized for solo concerts, chamber music, and full orchestra. Helzberg Hall will also enable the Kansas City Symphony to rehearse and perform in the same space, something it has been unable to do at its current home, the Lyric Theatre. The visual centerpiece of Helzberg Hall will be a Casavant Frères pipe organ, which will be one of the finest concert hall organs in the country. Quebec-based firm Casavant Frères has custom-designed the mechanical organ in the French romantic tradition, with 79 stops, 102 ranks, and 5,548 pipes. The organ will be completed in spring 2012.
and the Power & Light District. Structural Engineer: Arup USA, Inc.
Local Structural Engineer: Structural Engineering Associates, Inc.
MEP/Fire Protection Engineers: Arup USA, Inc.
Local MEP Engineers: WL Cassell & Associates, Inc.
Civil Engineer: Taliaferro and Browne, Inc.
Landscape Architect: Reed Hilderbrand Associates, Inc. Features & Systems: Fixed acoustical canopy above the stage. Retractable banner system included in side walls and above fixed canopy. Six 1,000-pound point hoist systems to hang custom curved trusses. Five skylights allow natural daylight to filter into Hall.